In a week when we’re looking to #BeSpectacular ahead of the FEI World Equestrian Games™ (WEG), who better to profile than the young Colombian who burst onto the Vaulting scene by taking a gold medal at the FEI World Championships for Juniors at Ebreichsdorf in 2017. We caught up with Clavijo to get to know him a bit better, and he happily shared details about his training with us, as well as his advice for other up-and-coming vaulters and his goals for the future…. It was in fact Sylvia who got Juan Martin started in vaulting too; after watching her at the stables, he wanted to join in as well and began equestrian sport at five years old. His training has become the focus of his life lately, and he practices every day beginning at seven or eight in the morning and continuing until lunch. Starting mid-July, Clavijo will add another two hours to his training regimen to get ready for the WEG. "I focus on a few things for a considerable amount of time," he said. In the past, Clavijo also took lessons in gymnastics and dance to enhance his vaulting performance. To prepare for an upcoming stay in Switzerland for eight or nine months in October, Clavijo spends his afternoons studying German. He doesn’t have time for any real hobbies at the moment but enjoys venturing out in his free time with his school or Vaulting friends. "I would say having continuity between and during the exercises, for all compulsories, freestyles and tech moves." 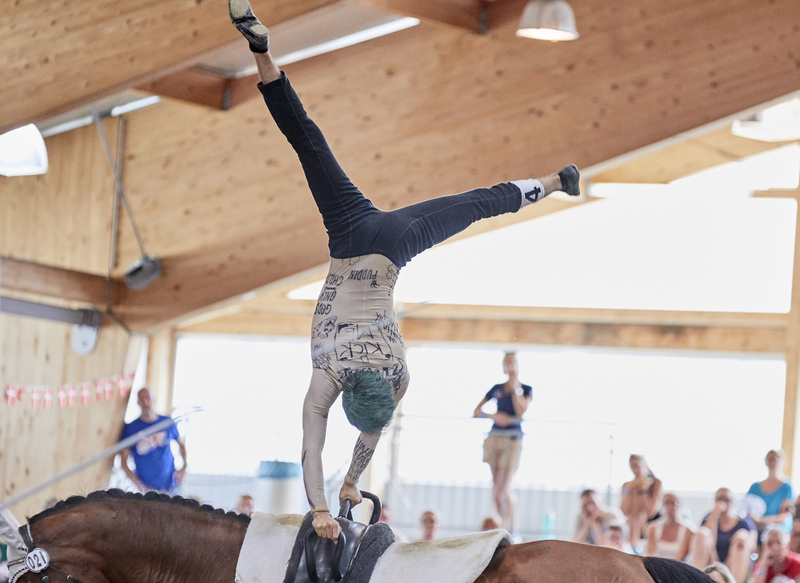 Surprisingly, nerves are one part of his Vaulting performance that Clavijo doesn’t much struggle with. All of that commitment and passion have paid off for Clavijo, and not just on the podium. The “self-satisfaction one gets when achieving goals for one’s own merit” is his greatest recompense when it comes to Vaulting. "It’s rewarding to make your time worthy when you are so devoted to the sport," he said. "I also find it very rewarding to become mentally strong." This attention to detail will assuredly be on display at the FEI World Equestrian Games™ in Tryon, North Carolina this autumn. What’s on deck for Clavijo after that? After his trip to Switzerland, he plans to study osteopathy. But his fans needn’t worry that he’ll disappear from the Vaulting community. "I don’t ever want to separate my life completely from vaulting,” he said. Given his tremendous potential now, that’s good news, and we hope to see him at many more events after Tryon. Keep up to date with all the FEI World Equestrian Games™ news on our social channels, and follow the events leading to North Carolina on FEI TV.